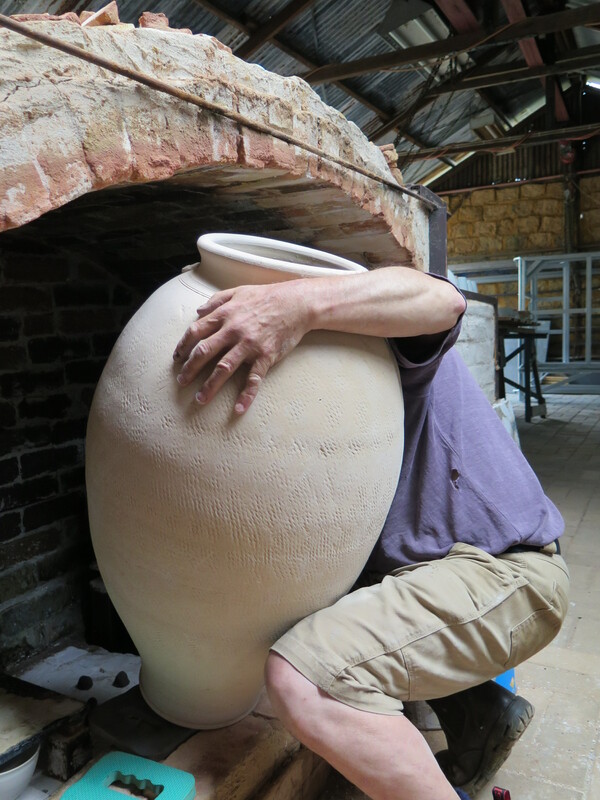 I have decided that I can fit in one extra firing before the Southern Highlands Arts Festival – Arts Trail, Open Studios weekends on the 7th & 8th of November, then again on the 14th & 15th. 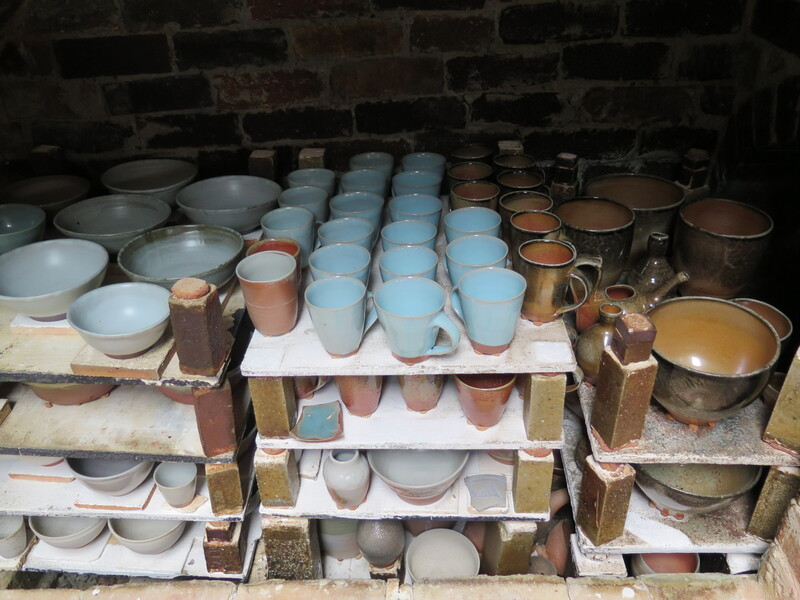 The kiln is unpacked and repacked while it is still warm. For some unexplainable reason, I wake up just after 3 am in the morning. Or is it still very late at night? I’m not too sure, but I’m wide awake, so I get up and walk down to the pottery workshop in the dark. It is quite overcast tonight/this morning, as there are no stars to be seen up in the blackness where the sky ought to be. It’s so pitch black and very quiet, it seems a shame to make any noise at all. I decide to only put one light on and work in the soft ambiance and stillness. I make the kindling fire from the scraps of wood that fractured off from the bigger logs as I was splitting them yesterday. 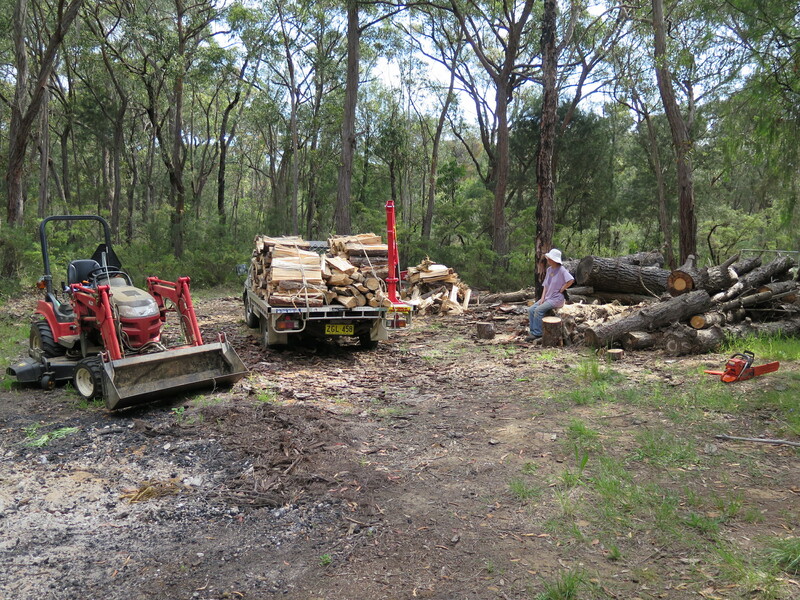 I spent most of the day yesterday in cutting, splitting and then, with Janine’s help, stacking it. We stacked half of it onto the truck. 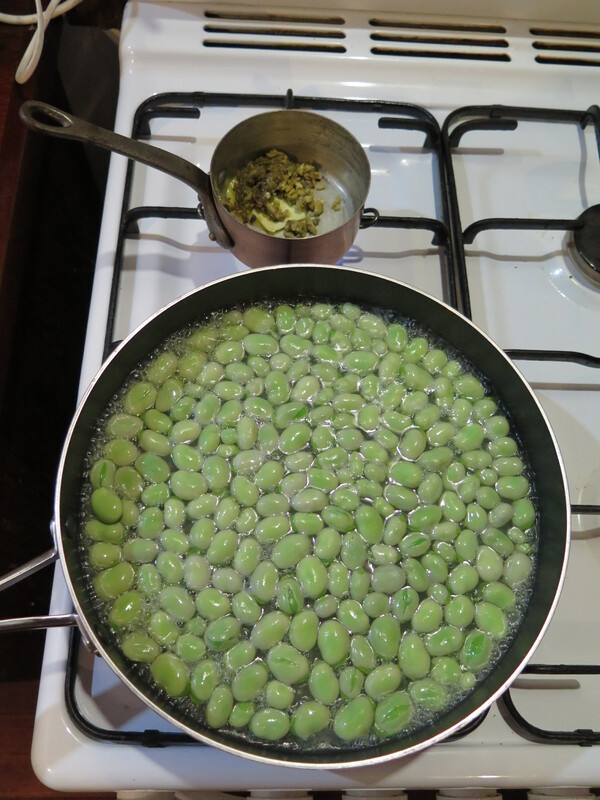 A very full load without sides on the tray. 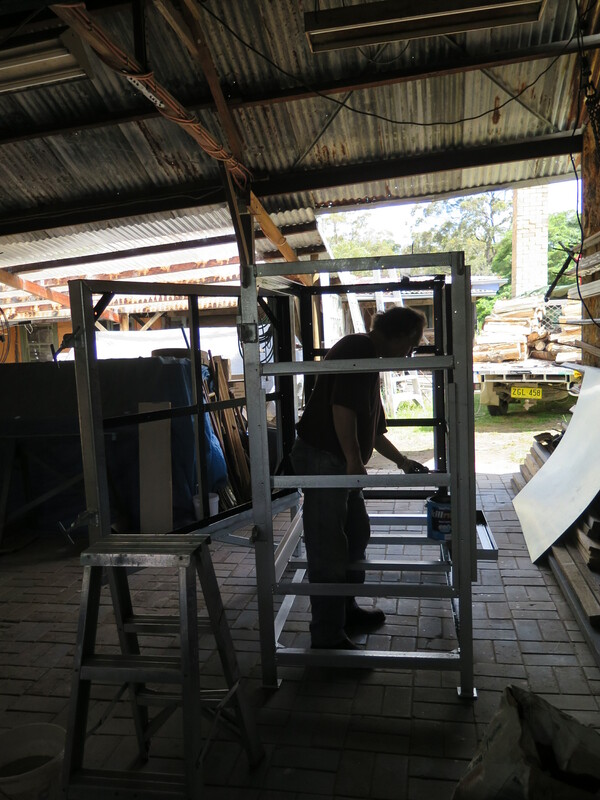 I drove it down to the kiln shed, covered it with a tarp against the possibility of rain overnight. I cut all the straight log wood into hob lengths, avoiding the branched bits. 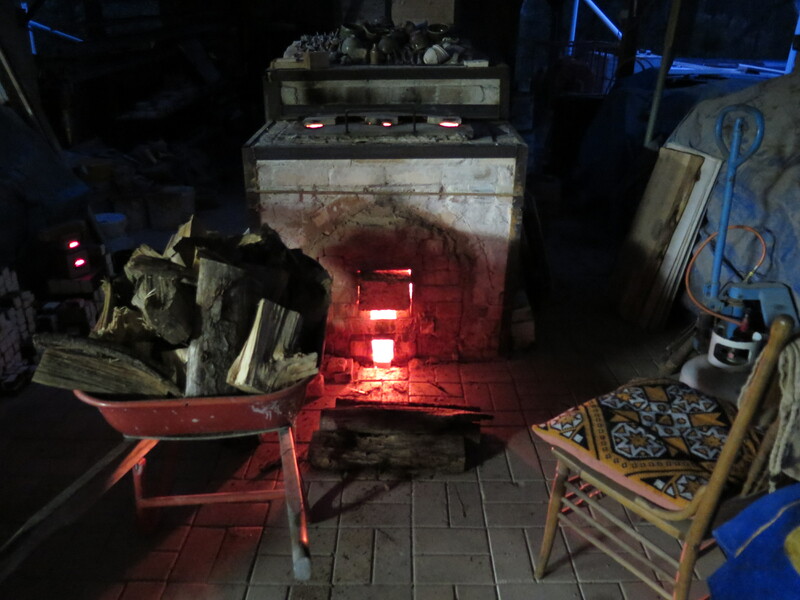 These, I cut around and leave aside for splitting into small short pieces for use at the beginning of the firing, when I start the fire on-the-floor of the firebox. 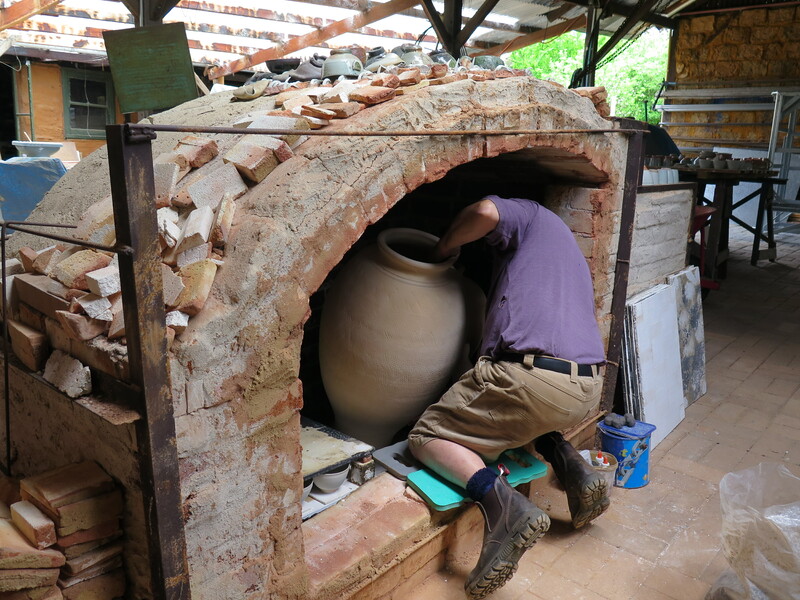 This first stage of the firing gently heats the pots up from cold, but also serves to build up a pile of embers in the base of the firebox which is necessary to ignite the big logs later on in the firing process. Every part of the tree is used. I don’t like to use branched bits for the longer hob wood, as it doesn’t split easily or well, often coming apart into horrid, sprawling, jagged pieces that are difficult shapes to stack and stoke, so I have developed a technique of spacing my chain saw cuts to get the maximum number of full length ‘hob’ wood pieces from the straight grained sections of the log and a smaller number of knotty, branched bits left in-between for use as floor wood lumps. I usually walk along the log with my metal measuring stick and mark off all the cuts with a red wax crayon. 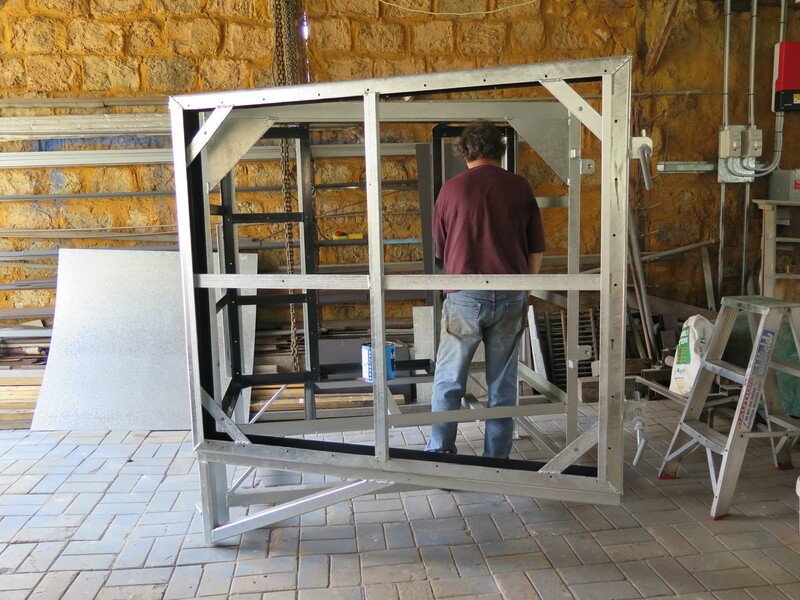 This takes a little time, but makes the cutting and sizing much faster and more accurate overall. 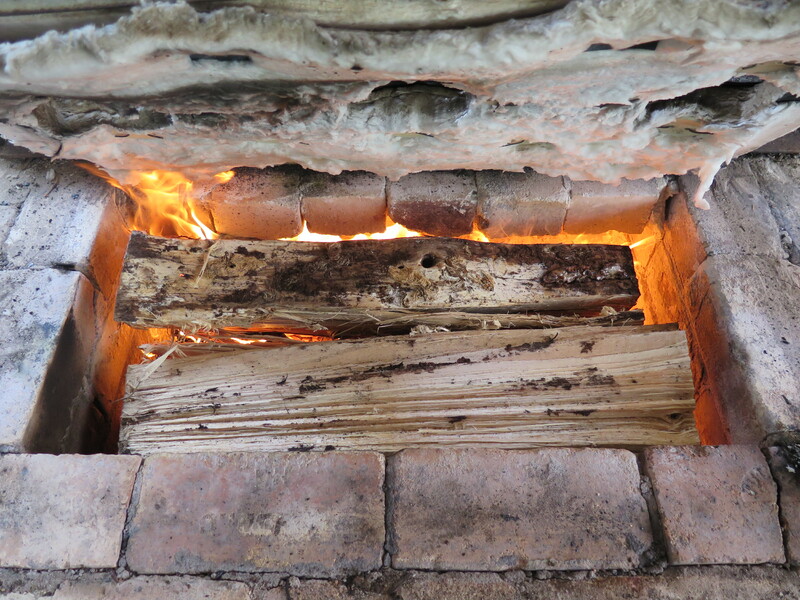 The kindling fire starts well and develops slowly into a full firebox of burning chunks, after 3 hours, there is enough ember built up in the lower part of the fire box, (‘the ash-pit’) on the floor, to support the fire starting off on the hobs, in the upper part of the firebox (‘on the hobs’). The long, thick pieces of wood introduced onto the ‘hobs’ from the top of the firebox, are held suspended by the brick ‘hobs’ just above the burning embers in the ash pit, placed here, they soon catch alight and start to burn fiercely. This takes the firing to another level, where the wood burns cleanly and thoroughly, allowing the temperature to rise evenly and steadily, up until it is time to begin reduction at about 1000oC. 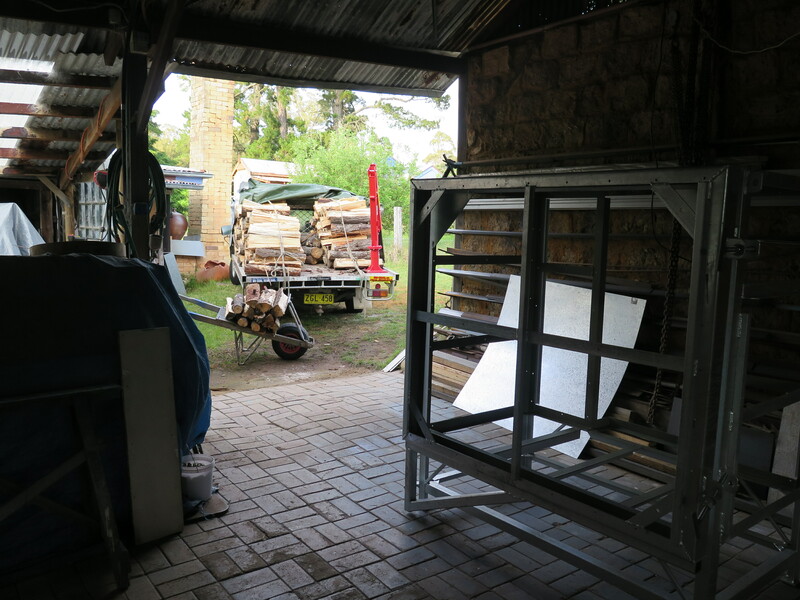 After cutting and stacking the kiln wood yesterday, I spent the rest of the afternoon in grinding, fettling, filing, acid-etching, washing and baking the newly galvanised kiln frame for Sturt Workshops prior to etch-priming. This is all mindless dull work that I have done a hundred times before, if not more and a good time to allow my mind to settle and watch itself wander, constantly returning to the hand/arm action of simple brushing. Paint on, Paint off. I don’t need to be in a buddhist temple in Kyoto to practice mindfulness. Any place will do, but it helps to be able to make the time for it and it alone. period of time unattended. As I sit and carefully place each new small piece of wood on the pyre, I suddenly realise that it is starting to rain. No wonder that there were no stars in the sky. This is no problem for me, as I took the precaution to cover the wood outside on the truck last night. 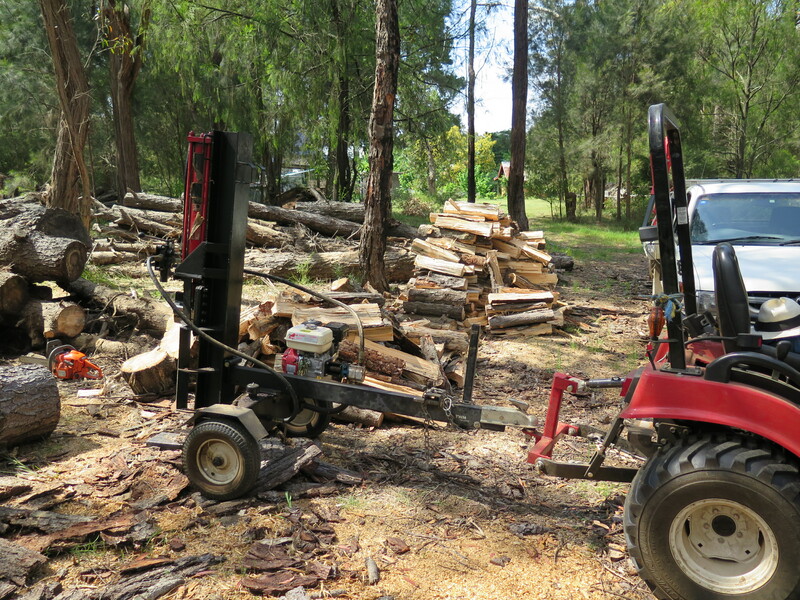 I’m using freshly split pine, which although being felled two years ago, is still damp inside when split from the log. I don’t want it to get any wetter until the firing is up to 1000oc. 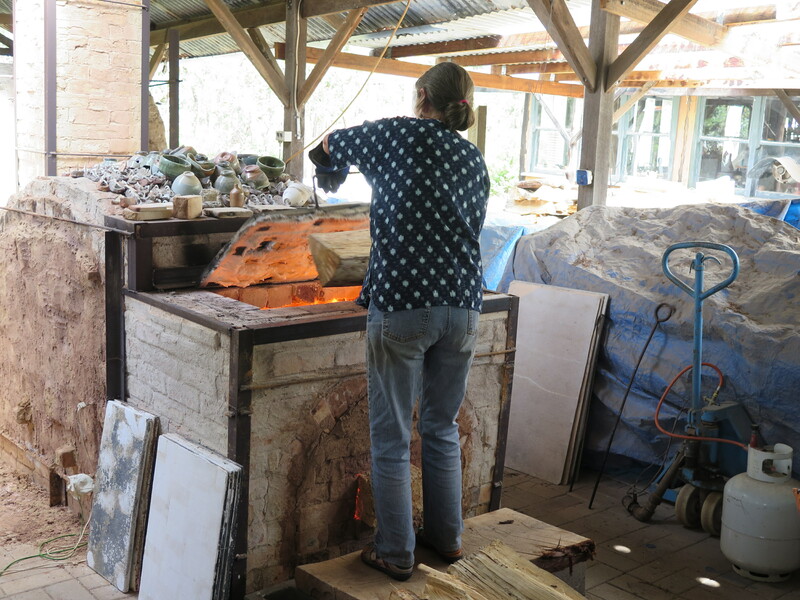 or more, then it won’t matter if the wood is wet and may even be of some use in creating the ‘reduction’ atmosphere in the kiln, which changes the colour of the clay bodies and glazes. Such is the odd nature of burning wood in a potter’s kiln. 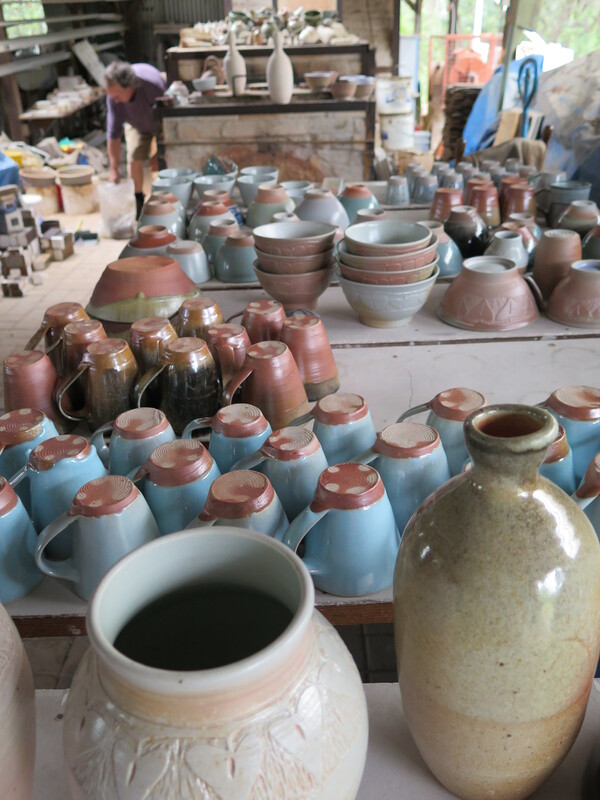 Pottery may seem superficially to be a simple craft activity, but there is a whole world of science, chemistry and associated technologies that need to be learnt, assimilated and internalised, so that you can then work intuitively and creatively in the medium. 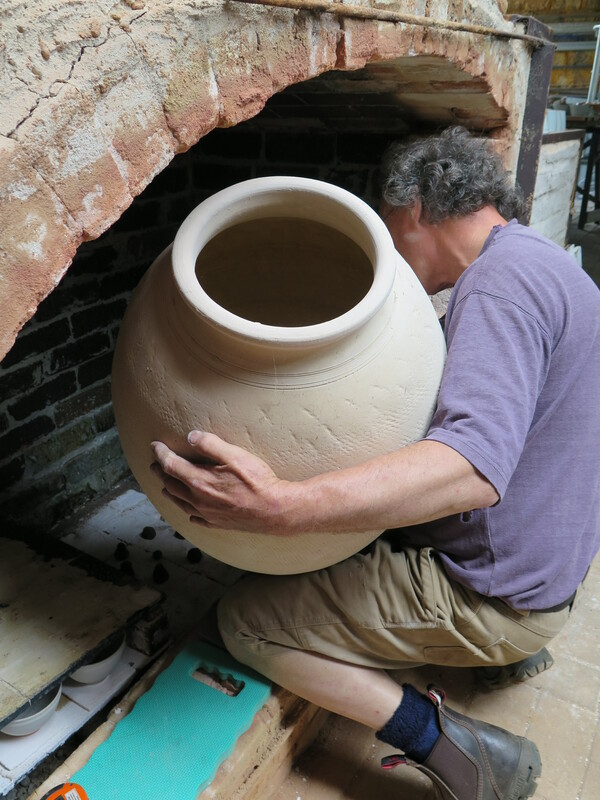 In this firing I have 3 large jars and then a lot of bottles, with a few shelves of smaller domestic pots underneath. 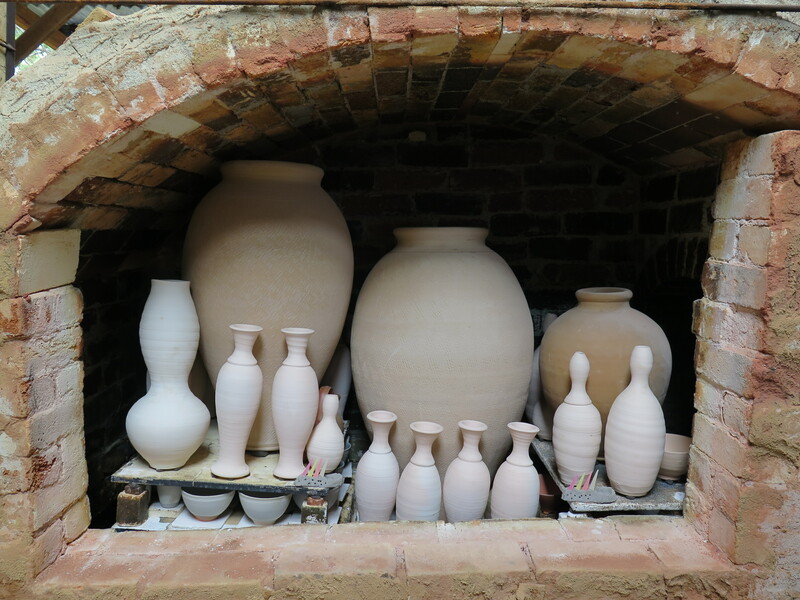 This firing isn’t very efficiently packed, but there is no easy way to get these big round jars into a more-or-less square box of a kiln chamber. That is just the way it is, so I do the best that I can with what I have to work with. I have done this so many times, that I have judged the amount of wood needed, down to the the last half wheel barrow load. 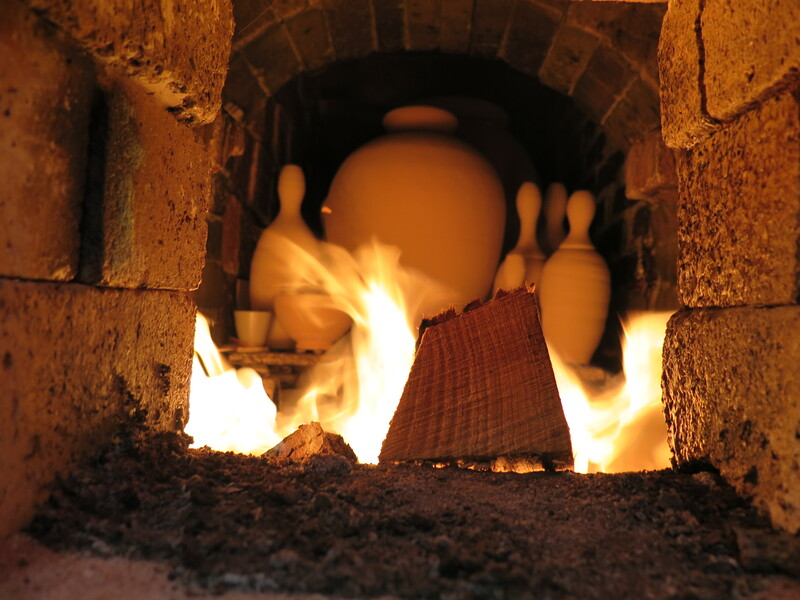 The firing proceeds smoothly and evenly right up to top temperature of 1300oC or cone 10 flat, in 16 hours. Because I started so early this morning, there is time for a hot shower and a relaxed dinner back up in the house, even a bottle of wine to celebrate. This is civilised kiln firing. Perhaps even Laid back ? 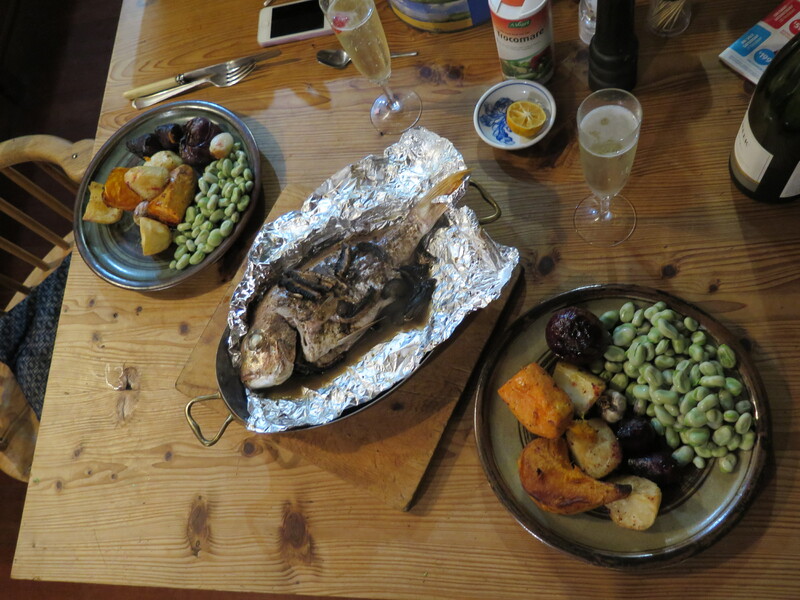 We bake a whole snapper for dinner with some freshly picked broad beans from the garden. The are perfect just now. Sweet and juicy without any starchiness at all, just the way that I love them. This is the 2nd pick and there will probably another couple before they get too big. 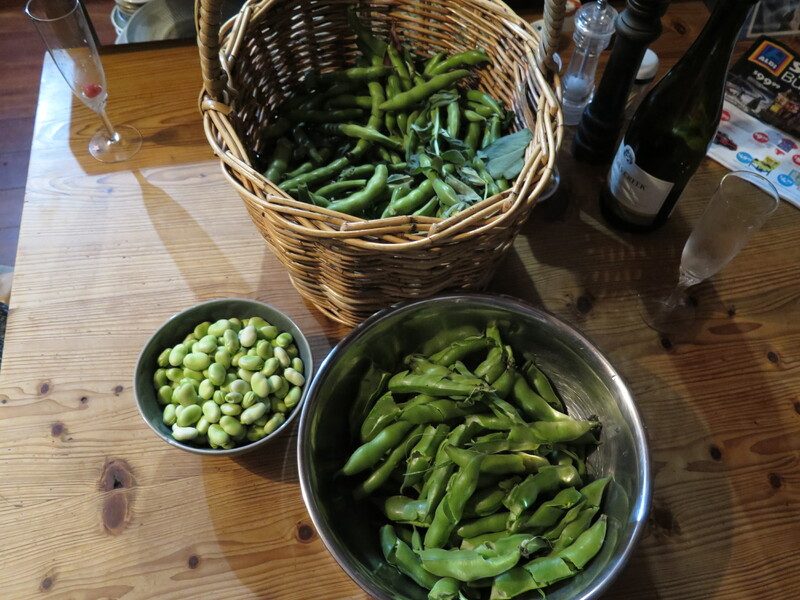 The first few beans are eaten raw as an entre, perfect with a glass of chilled white wine. We bake a few potatoes, sweet potato, red onions and some pumpkin. 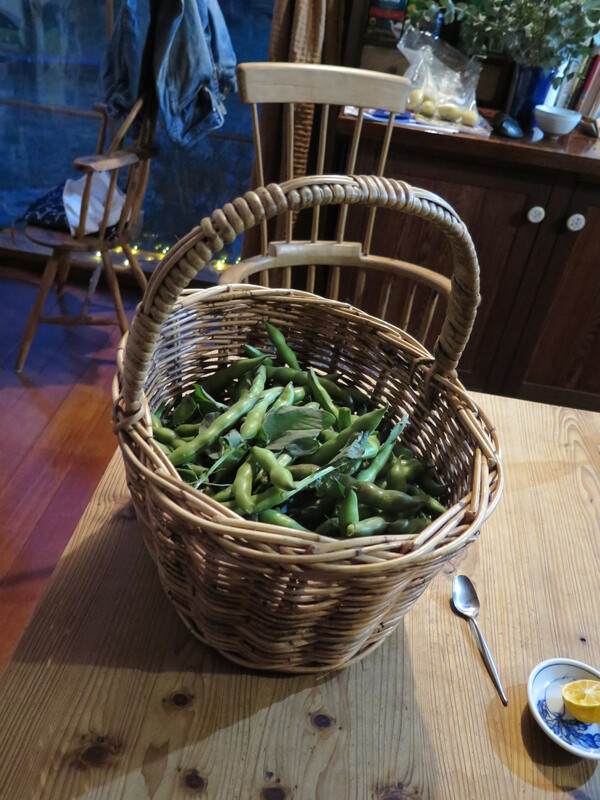 Our garden feeds us very well! I bake the fish with some mushrooms and slices of lemon and serve it dressed with a sauce of melted butter with finely chopped anchovies, capers and green olives. It’s a tough life, but some one has to have a go at it. Tomorrow I will start to grind, sort and clean all the pots from the last firing, spend a bit more time in the garden and add another coat of paint to the kiln frame waiting in the factory. This entry was posted in in the kitchen, In the pottery, kiln firing, self-reliance by hotnsticky. Bookmark the permalink.